Goalball is the most popular team sport for the blind and visually impaired. The sport originated in 1946 when Austrian Hanz Lorrenzen and German Sett Reindle developed the game as a way to keep blinded WWII veterans physically active. Goalball has since become the premier team sport for blind athletes and is played competitively in 112 countries. In goalball, two teams of three players each face each other across a court that is nine meters wide and 18 meters long. The object of the game is to roll a basketball size ball with bells inside over the opponent’s goal line. Your opponents listen for the oncoming ball and attempt to block it with their bodies. Once they are able to stop the ball and take control of it, they become the offensive team. The player’s zone is marked at either end of the court by taping a heavy string down to the court for the players to feel with their hands or feet. The player zone is 3 meters deep and extends the width of the court. Each player zone has three orientation lines which the players use to line themselves up and maintain their orientation to the court. Three meters in front of the player’s zone, is the highball line. The goalball must touch the floor at least once before crossing this line or a penalty is given by an official. Other common penalties include holding the ball too long, one player throwing too many tomes consecutively and touching your eyeshade without permission from an official. When a penalty occurs, the guilty player must defend the entire court by himself. The game consists of two 12-minute halves and takes about an hour to play a full game. The defensive team usually sets up a zone defense. The player in the middle of the court is called the center. The center is the primary defensive player. He or she plays at the front of the player’s zone and defends a majority of the court. The players to the right and left of the center are called wings. The wings are usually the primary offensive or throwing players. Defensively, they play behind and to the left and right of the center defending their respective areas. During the game, the center will usually stop the ball and pass it to a wing. While the wing is throwing the ball, the center will reorient themselves to the center of the court. Knowing that a thrower is slow to return to his defensive position, or that a player might not be in his defensive position, many teams will attempt a “quick throw” hoping to catch their opponent out of position. Curve balls, off speed balls and various other balls are sometimes thrown hoping to confuse the other team. Players may quietly change wing positions with the ball hoping to surprise the defending team by throwing from a different side of the court. The size of a basketball, a goalball is also hollow and weighs about 2.8 pounds. Bells inside the goalball let players know where the ball is going. You can purchase goalballs through USABA here. In an effort to make sure everyone is on the same playing field, all players must wear blacked-out goggles. Some teams use commercial goalball eyeshades however, ski goggles are often a lower-cost and preferred alternative. Although any type of tape can be used to cover the ski goggles, you need to ensure it is important that no light can be seen through the lens and vent areas when the goggle is placed against the face. You can purchase USABA eyeshades here. Adhesive patches are required in all major competitions and are applied directly to the players face to ensure the players cannot see during the game. Eyeshades are then placed over the patches. Any padding available at your local sporting goods store will work. However, most Team USA players prefer to use the Trace brand as the Trace pads seems to be more durable and last longer. There is no required hip padding but most players prefer to use hockey, football or soccer goalie pants. Though these pants are permitted, use of all of these is permitted, all members of the team must use the same color and style. Jerseys may be hockey, football, soccer, or any other jersey so long as they match and have numbers that are a minimum of 20 centimeters (8 inches) high permanently affixed to both front and back. It is helpful to the officials and scorer’s table if the numbers are contrasting colors and easy to read. Two-inch wide gym floor tape is the best to use and may be purchased at most local sports stores. String (.003 meters in diameter) can be purchased at your local hardware store. It is suggested that you do not use duct tape on the floor as most of the time it will damage the floor; masking tape is also not advised as it tears easily and is difficult to remove. You can purchase prefabricated goalball courts on the USABA website here. Once your team becomes competitive, you may wish to purchase goals for them to practice with. Because goalball goals are specialized for the sport and the demand is small, they can be cost prohibitive. Several teams have produced low-cost goals using PVC. 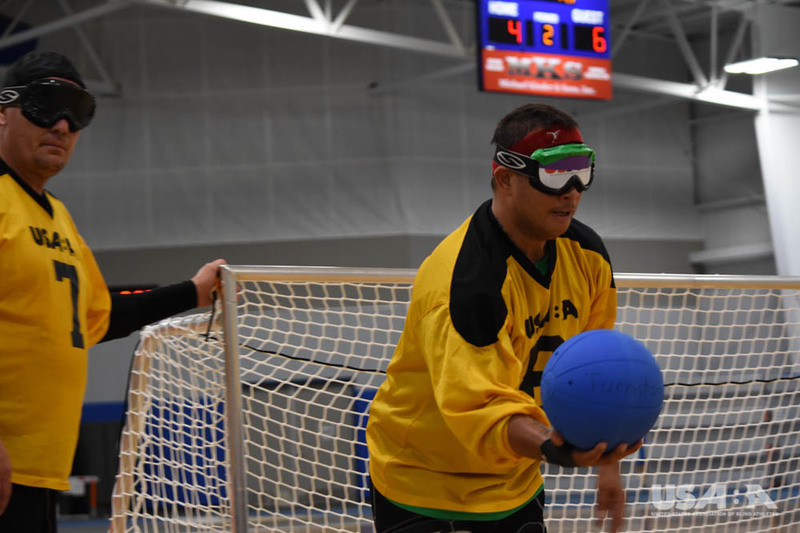 The dimensions of the goals can be found in the goalball rules on the International Blind Sports Association website. Now that you know how to play and what is required, we want to help you find a team to join! There are goalball teams and programs across the country of varying ages and levels of intensity. Contact Jake Czechowski to find a program or team near you at jczechowski@usaba.org. To confirm you meet the vision requirements to play goalball at a competitive level, you will need to become nationally classified. Vision requirements and application procedures can be found here. U.S. Association of Blind Athletes serves as the National Governing Body for the Paralympic sport of Goalball. Elite men’s and women’s goalball teams normally consist of six athletes but compete in teams of three. Both U.S. National Goalball Teams have a roster of six athletes each with two alternates. Both U.S. men’s and women’s goalball teams competed in the Rio 2016 Paralympic Games after qualifying at the 2014 Goalball World Championships in Finland. In Rio, the U.S. Men’s team took silver and the U.S. Women’s team took bronze. 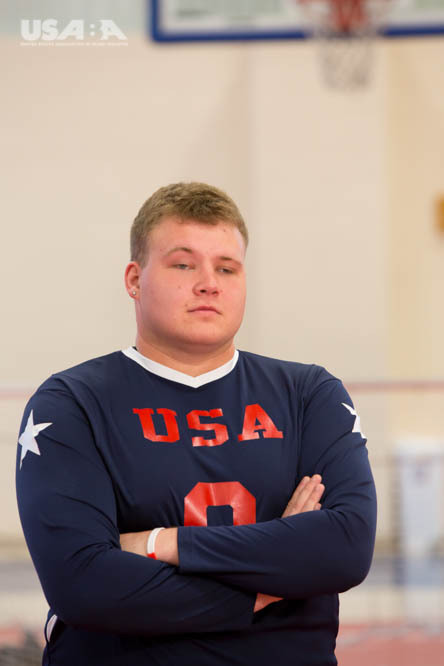 If you aspire to play for Team USA on the goalball court at the Toyko 2020 Paralympic Games, get involved with a local team in your area, compete in at least one regional goalball tournament (four per year) and the annual Goalball National Championships. Be sure to let your coach and teammates know about your goals so they can help and support you in your endeavors.